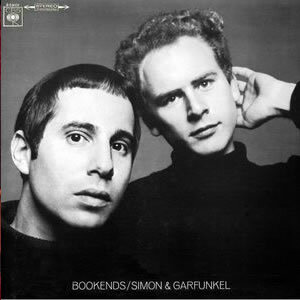 Bookends is the fourth studio album by Simon & Garfunkel, released on April 3, 1968 by Columbia Records. It was produced by Paul Simon, Roy Halee and Art Garfunkel. The songs of the first side of the album follow a unified concept, exploring a life journey from childhood to old age, while the second side contained unused songs intended for The Graduate soundtrack. Bookends was a #1 hit on Billboard's (North America) Pop Albums chart, as well as in the UK. Four singles charted: "A Hazy Shade of Winter", "At the Zoo", "Fakin' It" and "Mrs Robinson," which peaked at #13, #16 and #23 and #1, respectively.